Now that things are starting to settle down around the warehouse – if that ever truly happens – after the astrolabe incident and the death of Leena, I’m looking forward to seeing what’s coming next from our pals on Warehouse 13. Tonight is the supercool “noir” episode we heard about from Eddie McClintock, Joanne Kelly and showrunner Jack Kenny recently, but what about the other main characters? Saul Rubinek: Oh, my condolences. SciFiMafia.com: (laughing) It was fun. They were talking about some of the episodes that are coming up, and I was wondering if each of you have a favorite episode or story line that’s coming up the second half of the season? Saul Rubinek: Yes. Go ahead Allison. Allison Scagliotti: Well, I would say I actually just got off another call where I was talking about favorite episodes, and the one that immediately comes to mind is – Saul, you remember when we go out in search of Beethoven’s clock and how much fun we had together. Saul Rubinek: Oh, God. That was hilarious. Allison Scagliotti: And it’s the episode where Claudia turns 21. I have a big musical episode at the end and it was nice. But I just remember looking back on that week and just remembering how much fun I had doing it. Saul Rubinek: Well … a little bit of what happened (last season) was in order to build the relationship between Jinxy and Claudia, because they knew that his death was going to come and they knew that there was a huge – the stakes had to be really high. You know, Artie’s and Claudia’s relationship had to take a little bit of a back seat because of what was going to happen. So this second part of the season we’re back in a way to where we were a little bit – a little bit. Claudia and I get to do stuff that we did in Season 2 in a way. Allison Scagliotti: Yes. I mean that’s what I think. That’s why that episode sticks out for me because it had been so long since we got to you know do our thing and do our little lightning in a bottle dance. Saul Rubinek: Yes. That’s right. Saul Rubinek: We had a lot of fun together climbing poles in the Warehouse, whatever the hell we were doing. Battling flying gargoyles or whatever we were doing. I have no idea. Saul Rubinek: We’re like a group that’s in Heaven and when we have guest stars that come in – and we do have, you know, some great people. We have this – I’m terrible with names, but I know Jaime Murray’s coming back once we’ve figured out her schedule because she was shooting the first season of Defiance. And we’ve managed to find a way to get Kate Mulgrew back, and we had some great – Joel Gray of course, which was really great for all of us, because it was kind of awesome to have him on our set. What an icon. Saul Rubinek: And you know, we really had a great time the whole last part of the season because Artie could be Artie again and we could go back to what we were used to. Although, it was really cool doing a very dark arc. Really cool. Aaron Ashmore: And there still is some interesting stuff, you know even though things kind of get back to a little bit more maybe what we were kind of used to in the previous season and that. But also, you know, we don’t erase the things that happen, so all the characters have changed and then we’re all sort of still dealing with these things in these episodes coming up, so I think that’s really interesting for the characters as well. You know, there’s not really a reset button to take away what happened to Artie and what – you know, what did, so I think that’s really cool too is getting to play all those things and seeing how the characters change and adapt to that stuff. Saul Rubinek: Well you know what’s really kind of interesting. I’ve been watching a lot of different kinds of series of TV. And because of the mandate that Jack has set up and has gotten agreement from the studio network to do – because right from the very beginning, it doesn’t take itself completely seriously. The show is able to pack so much story in an entertaining way. When you’ve got a really serious show, like your brother (Aaron Ashmore‘s twin brother Shawn Ashmore is on Fox’s The Following) is doing which I like, and it’s a very successful show, The Following, they can only do so much. If they were going to do more, it would have to go comic, which is the last thing that that show needs to do. They can only set so much in motion you know. But you look at like some of the serious shows that are on, we do three episodes worth of their stories in 40 minutes. I mean I was looking at – just the premier of our show, setting up two major characters, finishing an arc that had to do with the whole destruction of the planet, trying to figure out a way psychologically for Claudia to forgive herself, and setting up an entirely new premise for a season all done in 40 minutes. I mean, I continue to be impressed with the storytelling. It’s probably why we have such a good time is because we bounce around like that from humor to seriousness. And this next nine episodes, I really want you to tell your readers about (are) probably the biggest chances that they’ve ever taken tonally from anything we’ve ever done. I think it comes from – I don’t know, what would you say Allison? Confident? I guess they’re just confident now. Completely confident that our audience is going to follow us, you know, as long as we’re true the characters. Allison Scagliotti: Well yes. I mean, to borrow some language from all the (blogisphere), we’re road tested and fan approved. Saul Rubinek: Yes. Yes. I think that’s it. Well, I mean that kind of answers your question. SciFiMafia.com: No, it absolutely did. Do you want to illuminate us at all about the “biggest chances” you referenced there? Saul Rubinek: You know if we did that – I can tell you this; that it was really cool – you’re going to get to meet Steve’s ex-boyfriend. I don’t think (that’s done) a lot. And that’s a very interesting emotional and hilarious episode you know. Allison Scagliotti: I was straight up mad I was not on that storyline. Saul Rubinek: Yes, I know. Both of us were. Aaron Ashmore: You guys would’ve just embarrassed me. I know it. Saul Rubinek: The other thing – yes, the other thing that’s going on – but this is really interesting and one of the most interesting parts of the arc of the whole show. From the very beginning of bringing Allison on as one of our team is that her growing up and getting older has become a part of the show for the character, and that’s been because I think Allison has fought for it. You didn’t have to fight hugely hard because Jack is a friend and has worked with Allison when – how old were you when you first worked with Jack? 13 or 14? Allison Scagliotti: Yes. I was 13 when we did a pilot together. 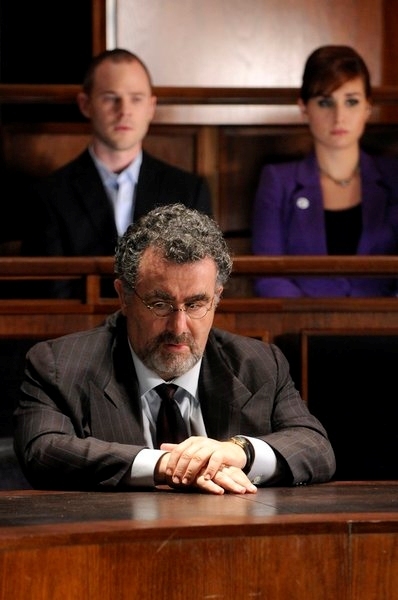 Saul Rubinek: 13, yes. So he has seen her and she got hired when you were 18 you know? Allison Scagliotti: Yes. That’s right. Saul Rubinek: So now she’s going to have the responsibility of the Caretaker of the Warehouse that’s coming. That’s certainly been set up. Saul Rubinek: And whatever that does for her, both – I guess it’s something that she can’t help having this responsibility, and it’s a daunting one. I tell you what I think is interesting is that they found a way, way back when – I mean, you guys I guess were also fans of Battlestar Galactica like I was, so they were able to talk about politics. Saul Rubinek: Battlestar Galactica was – one of the reasons it was such a great series was that it was able to talk about modern politics freely because they didn’t have to name any names and it was done metaphorically because it was talking about the future. In this sense, the writers have found a way of talking about what their concerns are. Whether it’s sexual politics, family dynamics, mother/father relationships, how grief plays out in a family dynamic, and how you have to find a way to keep a sense of humor or keep yourself going in the face of tragedy. These are the most important elements. The rest of it, the storyline stuff and how that plays out, how an artifact is found is fun and inventive for sure, and they have a lot of fun with history. And, I doubt if any writer’s room uses Google as much as our writer’s room. But, the most important part of it has to do with the way they’ve been able to talk about their concerns. Look. I think any successful show on television – really successful show on television – even if you’re talking about the Walking Dead, it’s because people care about how that family dynamic works and how the relationships work, and that’s what our writers have done. It’s why we’ve stayed on the air. It’s why I hope we stay – keep staying on the air, which we’re not sure about. You got to get your readers to watch us, and hopefully our core audience will come back and tell their friends. We are not a sure thing you know. Allison Scagliotti: Maybe we could start a fan campaign like you know have fans that mail endless amounts of fudge to Syfy. Do you smell fudge where there once was no fudge? Thanks so much to Saul Rubinek, Allison Scagliotti, and Aaron Ashmore for taking the time to talk with SciFiMafia.com about Warehouse 13 past, present, and future! Warehouse 13, starring Eddie McClintock, Joanne Kelly, Saul Rubinek, Allison Scagliotti, and Aaron Ashmore, airs Mondays at 10/9c on Syfy.